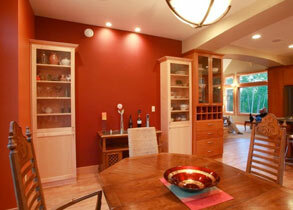 Jons Woodworking – Custom cabinetry made in Alaska to fit your space. 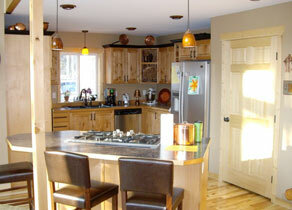 Custom cabinetry made in Alaska to fit your space. Our aim is simple – to deliver a high quality cabinet solution, built to accommodate your design and needs, working together with your team. 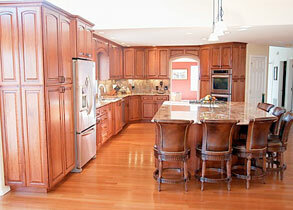 This allows us to bring your project together in a way that would be hard to emulate with box store cabinets. With our skilled team of workers who know what they need to do to make a job work just right, we follow a simple protocol – if the project taken on by us, it’s given 100% commitment until it’s finished. We are conscious of indoor air quality and endeavoring to reduce the impact on the environment. We are committed to finishes with minimal impact on indoor air while maintaining durability and efficiently using lumber and panel materials harvested and manufactured responsibly. Everything that we make is created with the idea of making it yours and yours alone. 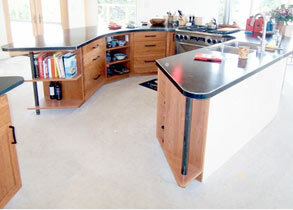 With your complete design or our ideas combined together we will create custom finished projects that impress! Jae Shin, Shin + Associates, Inc. 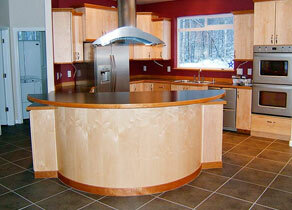 Here at Jon’s Woodworking we provide top-quality custom cabinetry to meet the needs of all Alaskans. Whether you are a builder, architect, designer or home owner we can design, build and install your dream into a finished product to fit your lifestyle. We specialize in custom cabinetry and we can help you with the design of complete kitchen and bath cabinets, mantels, entertainment centers, wall beds (murphy beds), closets, custom built ins and organizers. At our production facility located in Palmer, Alaska we have a group of professional craftsmen who will work with you to help make the design process turn-key and your home vision a reality. We apply the best methods and materials, combining modern CNC manufacturing technology with old school workmanship to offer a superior product and take your kitchen cabinets far beyond simple storage. We can provide you with functional and eye-catching cabinets for your bathroom. Our efficient and flexible production facility gives us the ability to create custom pieces that are unmatched in craftsmanship and precision. We design, build and install custom entertainment centers, wall units and built-ins, our goal is to create custom woodwork of the highest quality and innovation, The difference is in the details. Since 1996, Jon’s Woodworking has been committed to providing the most in-depth level of creativity, craftsmanship and consistency. We are located in Palmer, Alaska and we serve the greater Mat-su and Anchorage area with pride. 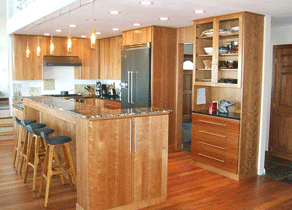 Jon’s Woodworking provides high-quality custom cabinetry to meet the needs of Alaskan citizens in any way you can imagine. From abstract designs to something original and functional, we have the means and the know-how to make any design idea possible. Whether you are a builder, architect, designer or home owner we can design, build and install your dream, turning it into a finished product to fit your requirements and space with ease. 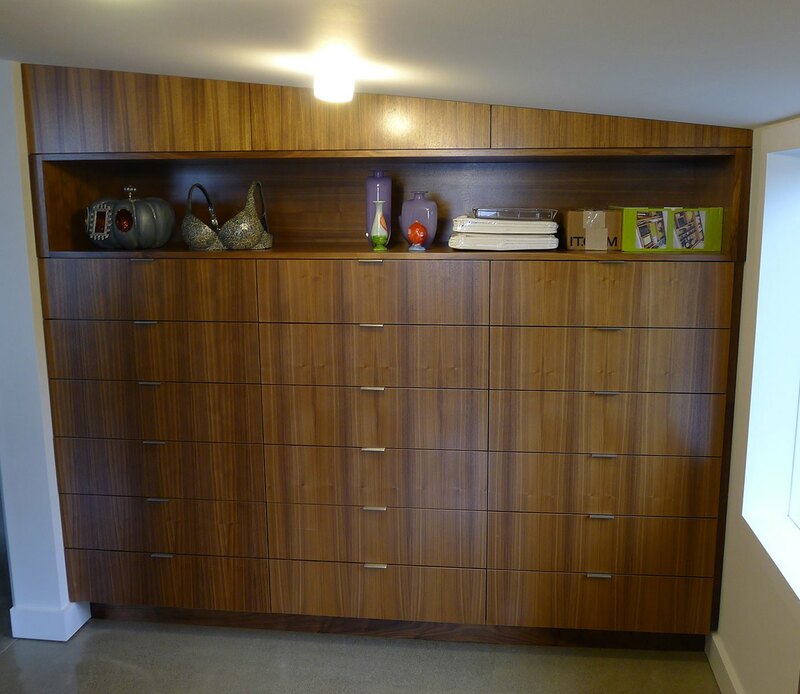 Jon’s Woodworking specializes in custom cabinetry, delivering the most expansive detail possible in every way that we can. Also, we can help you with the design of complete kitchen and bath cabinets, mantels, entertainment centers, wall beds (murphy beds), closets, custom built ins and organizers. Whatever you need, we’ll create it! Our production facility and professional craftsmen in Palmer, Alaska work with you to help make the design process turn-key and your home vision a reality. 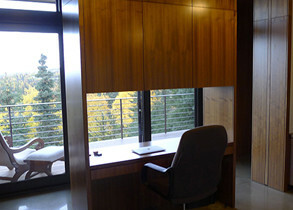 Come and talk to us today if you want to make the most of any wood projects you may be dreaming of. 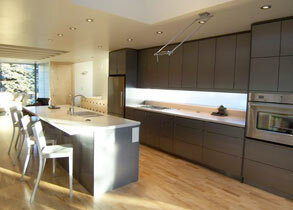 © Jon's Woodworking | All Rights Reserved | Design by: Infinite Color Inc.